On your arrival at the Vienna Airport you will be transferred to the hotel of your choice in private car. Rest of the day is at leisure. Overnight. Breakfast. Today we shall proceed for the city tour of Vienna on SIC basis. See the most important sights of the Austrian capital. Drive around the famous 'Ringstrasse', Vienna's main boulevard, past the State Opera, the Museums of Fine Art and Natural History, the Parliament building, the Burgtheater (National Theatre), the City Hall and the University. Then drive along the Danube Canal and pass by Hundertwasser's 'Kunsthaus' and the Prater Park with its Giant Ferris Wheel. Overnight. Breakfast. Check out and we shall transfer from hotel to station in Vienna by private car. Board your train from Vienna to Salzburg. On your arrival transfer from Salzburg station to the hotel of your choice in Salzburg by private car. On arrival check into your hotel of your choice freshen up and we shall proceed for the Salzburg city tour. Explore Salzburg the most beautiful cities of the world today. Enjoy the stunning views of the city. You can stroll through the UNESCO-listed old town and stop at the city's world-famous attractions, tourist areas, and inviting neighborhoods. Listen to anecdotes about Salzburg's past, present, and future and get insider tips about where to shop, dine, or dance the night away. The tour includes the Mirabellplatz, Mozartsteg Bridge, Leopoldskron Palace, the Regional Theater, and many other attractions. Overnight. Breakfast. Visit one of the most beautiful lake side villages in the world. Start your journey travelling through the famous UNESCO World Cultural Heritage Region Salzkammergut (Lake Area) passing by many picturesque villages en route until you arrive at Hallstatt the ‘Pearl of the Salzkammergut’. Spending about 2.5 hours in Hallstatt, it is hard to know where to start. You may explore the old town visiting the world-famous Bone House behind the Catholic Church or turn back time at the local museum – since a whole era of mankind was named after Hallstatt, the so called Hallstatt Period (800 BC – 400 BC). Take a leisurely lakeside walk seeing houses above you clinging onto the mountainside, pass by the Mühlbach waterfalls or take the funicular (optional, reduced rate for tour members only) and experience the magnificent “World Heritage View”, 360 meters above town, on the Hallstatt sky walk! Hallstatt is a destination of most unique historical and cultural significance, be sure not to miss this hidden gem. Return back to hotel. Overnight. Breakfast. Check out and transfer to Salzburg station by private car. Board your train to Zell am See. On arrival at the station transfer to the hotel of your choice by private car. Rest of the day is at leisure. Overnight. Breakfast. Today the day is at leisure. We would recommend Kitzsteinhorn Excursion. Gipfelwelt 3000 delights with sensational views from two panorama platforms across the Hohe Tauern National Park, to the Zell Basin and the surrounding three thousand meters high mountains. Discover the summit of the Kitzsteinhorn from the perspective of the majestic golden eagle at the Cinema 3000 and learn many interesting facts on free of charge guided National Park Ranger Tours. Overnight. Breakfast. Check out and transfer to station in Zell am See by private car. Board your train from Zell am See to Innsbruck. On arrival transfer to the hotel of your choice. Overnight. Breakfast. We shall proceed for the fantastic and sparkling world of Swarovski. 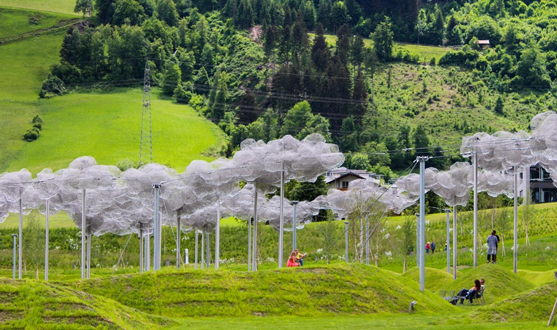 Aboard a fast and comfortable coach from central Innsbruck (30 minutes’ drive), you will be taken to the world famous Swarovski Crystal World, in Wattens. The water spouting Giant (a remarkable huge face sculptured on top of a rock) will amaze you. Inside the Giant, a whole crystal world awaits you: the Chambers of Wonders containing the Planet of Crystals, the Crystal Dome, the Crystal Theatre, the Ice passage and the Floating Poem, displaying the artistic perfection of Swarovski. Check out and transfer to station in Innsbruck by private car. Board your train from Zell am See to Munich. On arrival transfer to the hotel of your choice. Overnight. Breakfast. Check out and transfer to station to board your train to Munich. On arrival transfer to the hotel of your choice and rest of the day is at leisure. Overnight. Day 10: Munich City Tour on SIC basis. Breakfast. You will meet your local guide at Marienplatz, at the Fish-fountain, where you will start the guided tour exploring the city. The capital of Bavaria is well- known for its annual Oktoberfest and historical beer halls, like the Hofbraeuhaus. In the pedestrian area of the old town, Marienplatz is a central square with landmarks such as the Gothic New Town Hall with the popular daily "Glockenspiel" show, the Old Town Hall and St. Peter, the oldest church in town. You can get a glimpse of Hitler's life and the Nazi movement through the stories of your tour guide. Rest of the day is at leisure. Overnight. Breakfast. Transfer from hotel to Munich Airport by private car for your flight back home. 2 nights each in Vienna, Salzburg, Zell am See Kaprun, Innsbruck and Munich. City tours in Vienna, Salzburg and Munich. Excursions to Hallstatt, Top of Salzburg, Swarovski Crystal World. Airport transfers as mentioned in the itinerary for Gold and Platinum category. City transfers for Platinum category. Train tickets as mentioned above for Gold category. Horse carriage ride for 25 minutes in either Vienna or Salzburg. One 3 course candlelight dinner. Optional activities / sightseeing’s not mentioned in the inclusions. Silver category train and transfer rates are extra.